Having been away for a couple of weeks, there was a sudden rush to gather in the chillies before they were spoilt by frosts. The polytunnel only offers 3 or 4 degrees of protection, and chillies are not keen on the cold! 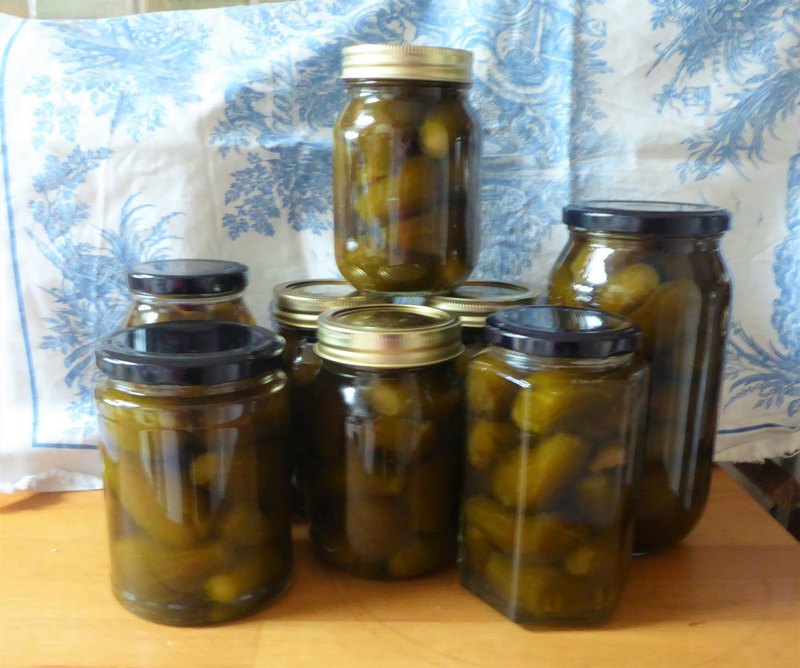 I ended up with several different varieties, and so spent two afternoons on these three different pickles. They should all last well enough until the end of the year in the cold garage, and probably beyond if we don't eat them all before then. 6. Put the rings into the prepared jar, and pour in the hot liquor to cover. These are similar to the ones bought as Peppadew peppers ("PIquante") which can be stuffed with cream cheese and the aim is to have some to offer as part of a buffet meal over the coming festivities. Any cherry-style chilli would wokr well though. 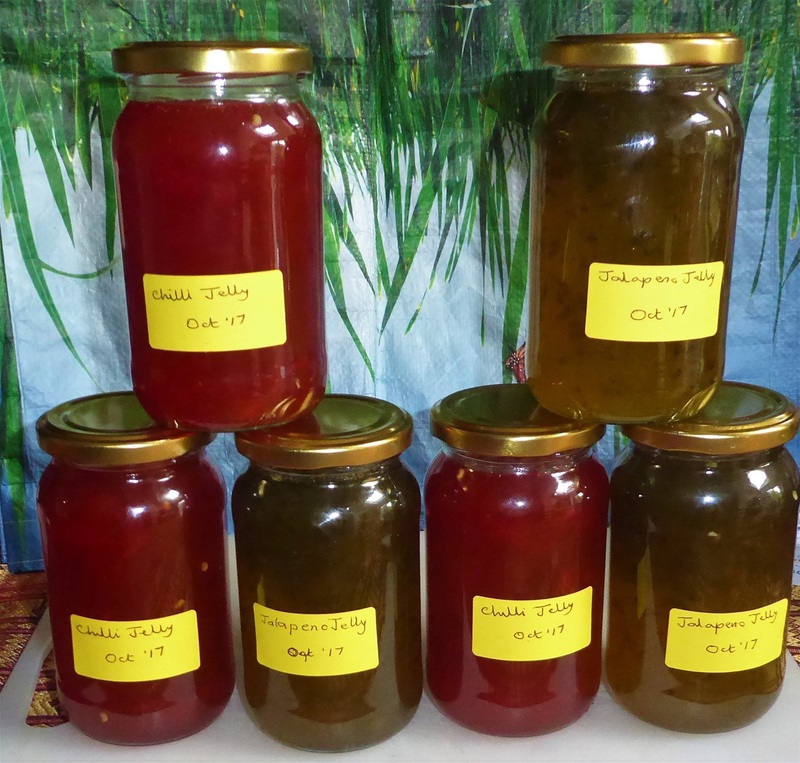 They did take ages to ripen, and I had hoped the the ones picked green would quickly turn red, but they were very slow and some began to soften alarmingly, so I used some green ones too. 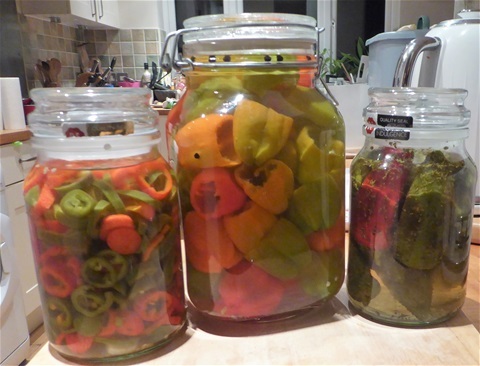 They look OK in the jar, and if other chillies are anything to go by, will taste less sweet than the red ones, but hopefully will still be tasty. 6. Now move the chillies slightly with a skewer to take out any air bubbles, then seal the jar. If you tip the jar slightly, more air bubbles may appear, and if thise means that the level of liquor goes down, then top this up. These are usually served grilled, rather thanbeing eaten raw, so I had to look around for a method of preserving them that could retain this pre-cooking, and found a recipe in Allrecipes that looked straightforward. I adapted it slightly as I was a bit concerned that the pickling liquor may not fully penetrate the chillies. I also felt it might need an extra flavour so have added some dried oregano, as pappers like this are served in Mediterranean areas and oregano grows wild there. This is the first time I have made a preserve in this style,so I decided to make just one small jar to try it out. 6. Test for a set using the cold saucer: the liquid will wrinkle slightly when you push it with your finger as it cools. 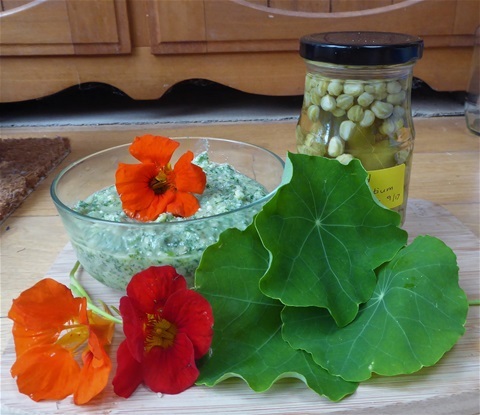 We add nasturtium leaves and flowers to salads every year, and enjoy their peppery taste, so I have no idea why it took me so long to think of using the leaves in pesto as well. After all, rocket leaves work well, so why not nasturtium? 3. Blanch the leaves in boiling water for 8-10 seconds, remove immediately with a slotted spoon and plunge into the cold water. Push the leaves under the water with the spoon. In the fridge, in a sterile jar, this will keep for at least three months, although in a covered bowl it'll certainly last a few weeks too. I promise you this is totally luscious and could easily be eaten spread on nice bread or used as a dip, as well as stirried into hot pasta. I am now wondering what it might be like made with feta instead of a hard cheese, so if the frosts stay away long enough I shall be giving that a go too! 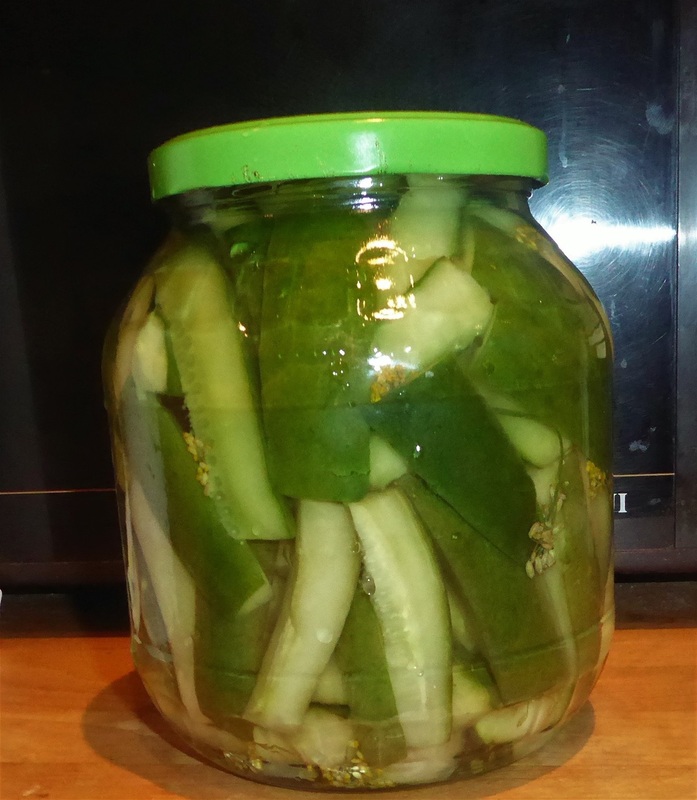 750g Cucumbers, sliced lengthways into quarters and most of the seedy jelly cut off, then cut into 5-6cm batons. 7. Wipe the edges and top of the jar to ensure there is no sweet vinegar remaining on it, and screw on the top. This should make sure you can get the lid off again! This time, I wanted the clean flavour of dll alongside the taste of the cucumbers themselves, but you can add all sorts of different spices to the vinegar, such as mustard seeds, cloves, coriander or cumin seeds, or garlic and chillies if you'd like. This is the recipe that I referred to in my blog, which took so much work to produce. However, if you are only making a more normal amount, such as using a kilo or so of figs, rather than the 9kg I started with, it would be much more straightforward. A week later, the figs are tasting pretty good, so here is the method, and be reassured there is no trace of the dreaded latex now! Latex can be very irritating, especially when combined with the rough fig leaves as you gather the fruits, so wearing gloves is a good precaution when picking and preparing them. Do not use a non sstick pan for the initial boiling, as you have to scrub hard to remove the latex from around the edges of it, and your non-stick pan would never be the same again. I used a stainless steel one. When you get to making the syrup and boiling the figs in it, a non-stick pan works well Forewarned is forearmed! 1 kg of small green figs, the ones picked off the tree in the Autumn If you have slightly more or less, it will be fine, as long as you make a little more syrup for a larger amount. Make sure they will fit in the pans you plan to use so you can make them all in one go, though! 1. Wearing gloves, trim off the stem of each fig and cut a cross in the base - the point of this it to allow the latex to escape. 1. Put the prepared figs in a large bowl of water. If the water turns very milky, change it for fresh a couple of times, then leave the figs to soak overnight, weighted down by a plate to ensure they are all submerged. 3. Repeat Step 2 - The point of this is that the expansion and contraction of the fig flesh enables the release of all that latex, so it is quite important! 5. Reduce the syrup by about a third. 8. Check the flavour of the syrup and adjust if needed. Do not worry that the figs lack flavour at this point: they will steep in the syrup in their jars. 9. Once the syrup is ready, pack the figs tightly in warm jars and pour in the syrup to cover them completely, leaving about 1cm space at the top of the jar.Poke out any air bubbles with a sterile bamboo skewer, and then put lids on. Straight sided pickle jars are easiest to use. 10. Leave the figs for at least a week before eating them: they get better the longer they are in the syrup. These are very good with vanilla icecream, or good, thick plain Greek yoghourt. Next year I shall try a batch with lemon syrup as well as the rose I think.